Anterior scalene muscle a.k.a. Scalenus anterior is most superficial among scalene muscles and is located deep towards sternocleidomastoid muscle. It is situated in the middle of the subclavian vein and the subclavian artery. The roots of the brachial plexus travel posterior towards it. The phrenic nerve traverses its anterior surface. 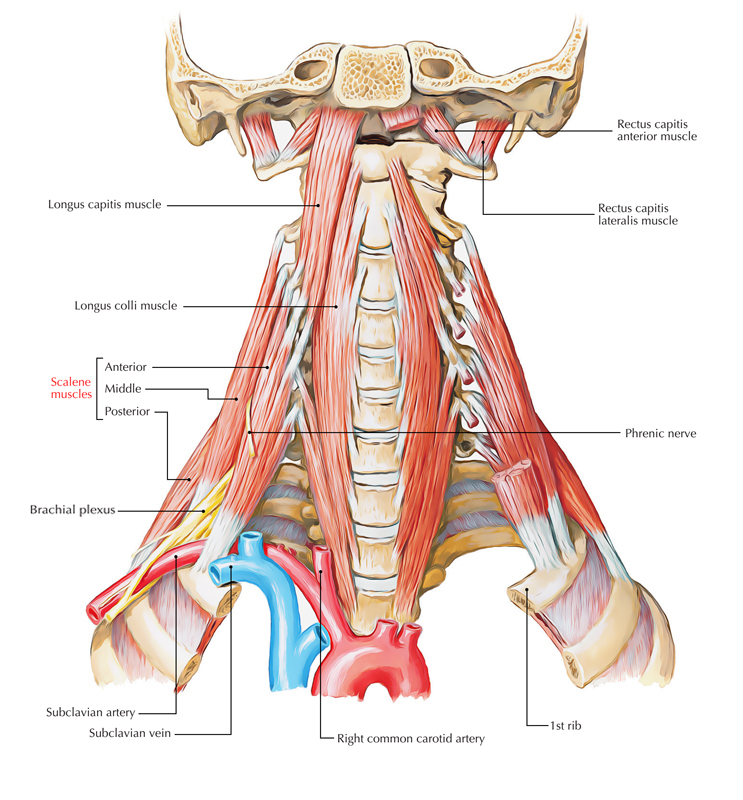 Due to its intimate attachments to many structures in this zone, it is the main muscle at the root of neck. It is a vital surgical marker. It originates from anterior tubercles of transverse processes of vertebrae C3, C4, C5, and C6. A narrow, flat tendon towards the scalene tubercle on the inner rim of the 1st rib. Towards the ridge on the upper surface of the rib anterior to the groove for the subclavian artery. Anterior scalene muscles are innervated by ventral rami of C4, C5, and C6 spinal nerves. Acting inferiorly, it bends the neck forwards and laterally. Rotates neck to the opposite side. It acts as a contributing muscle of respiration as it assists in order to lift up the 1st rib by functioning superiorly. 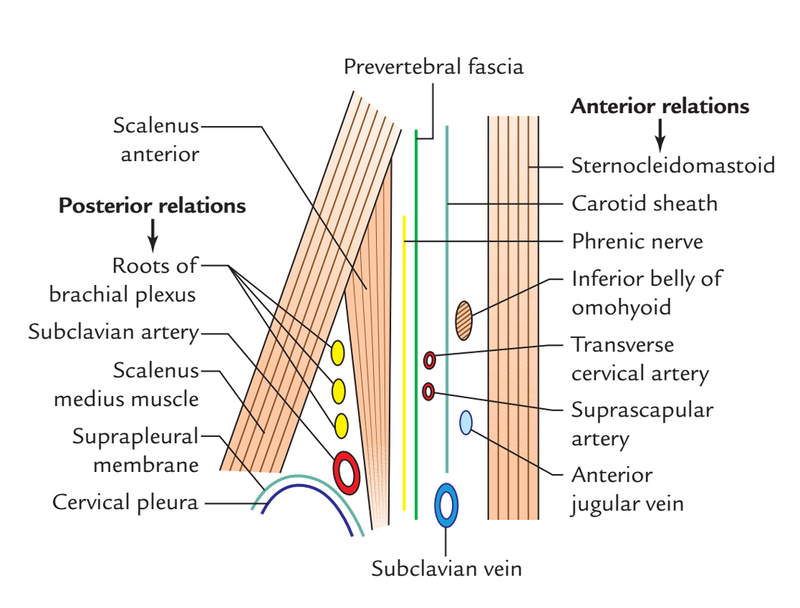 Phrenic nerve goes superficial towards it. Subclavian artery travels deep towards it. Brachial plexus is located at its lateral margin. Inferior belly of omohyoid muscle. Carotid sheath is located perpendicularly opposite to the muscle. Scalenus medius muscle (medial portion). The lateral margin of the scalenovertebral triangle or triangle of the vertebral artery is created by the medial margin of scalenus anterior. The lateral margin of the scalenus anterior and trunks of brachial plexus are related to each other. The ascending cervical artery separates the upper part of scalenus anterior and longus capitis. Stinging sensation and lack of sensation alongside the inner rim of forearm and hand. Gradual paresis and intrinsic muscles of the hand begin to waste.